It’s September. We’re into the middle of the red-hot MLB playoff race again. We’re also into the middle of the red-hot, or ice-cold (depends on how you describe it), battle for the 1st overall pick in next year’s draft. The same is going on on the other side of the Pacific. The 9th month is the most exciting month of the year. But before we lose our minds in the chaos and mayhem of the pennant hunt, let’s take a look at times that have flown by already. Here are some of the pitchers who performed exceptionally well in August, including some future and former big leaguers. The Niigata native, often referred to as the best pitcher in NPB, threw 7 innings in all 4 of his August starts, and gave up no more than 2 runs in each outing. In 29 innings in the 8th month of the year, he struck out 31 of 112 batters he faced (27.7 K%) and walked just 4 of them, posting a 1.55 monthly ERA. The 23-year-old sophomore right-hander entered August with the worst 5-game stretch in his young career. In 5 starts from July 5th through August 2nd, he gave up 24 runs on 40 hits, including 6 long balls, and walked 11 over 20.1 innings. After his 5th consecutive disastrous start, Norimoto was demoted to the bullpen and made 2 relief appearances out of it. Yet, after returning to the rotation on the 15th, it looks like he’s found his old form. In his first start back from the pen, the former Mie-Chukyo University hurler tossed a 1-hit, walk-free shutout, faced just one more than the minimum 27 batters, and fanned 9 of them on 111 pitches. In his next 2 starts, Norimoto went 8-and-3-0-0-4-7-0, 9-8-2-2-11-0, respectively. His final monthly numbers include a 1.95 ERA, which was 2nd best in the Pacific League (trailing only Kaneko), 34 K, 8 walks, 7 runs, 21 hits, and 2 HR in 32.1 IP. In the 23rd year of his professional career, the 40-year-old veteran is still dealing out there. Miura made it out of the 7th inning in each of his 4 August starts, including an 1-run CG against Yomiuri on the 7th. 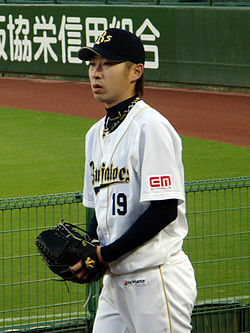 Overall, he posted a NPB-leading 1.20 ERA, struck out 18, walked 5, gave up 6 runs on 26 hits and 2 homers in August. Coming back from a stiff neck, the former Brewer enjoyed the best month of his first season in NPB so far. Outside of a 5-run, 4-inning outing against Hiroshima on the 13th, the southpaw tossed at least 7 innings and gave up no more than 4 hits in each of his other 3 starts. In doing so, Narveson put up an outstanding 2.00 ERA, a .202 opposing average, 18 strikeouts, walked 9, and gave up 6 runs on 9 hits (1 HR) in 27 IP. Otani possesses by far the highest future MLB upside among all NPB players, and one of the best 20-year-old arms in the entire world. So we’ll keep our bright eyes on whatever he does over the course of his career. After hitting 101 MPH multiple times in his one-inning all-star appearance, the 20-year old hurler was expected to show another step of development. Instead, he hit a little snag in August. Here are his walk totals in each of his 4 outings in the month: 3, 4, 8 (he threw 149 pitches in this one), 2. That’s 17, which was the 3rd highest mark among Pacific League starters over that span, and equals 85% of the total he had walked in the previous 3 months (May, June, July) combined. Although still recording strikeouts at a relatively high rate (27 of 125 batters, 21.6%), he struggled with location. The video below contains every single pitch from Otani’s penultimate outing on August 26th, where he walked a couple in early, but came back in form and struck out 9, limiting the Softbank Hawks to just 1 run on 5 hits before exiting after the 7th. After the game, Otani claimed that he “messed up the mechanics in the all-star outing and had been struggled with location, but refined after the 2nd inning.” Yet he issued a career-high 8 free passes again in his last outing on September 3rd. It will be interesting to see how Otani can fix the problem in the final month of the season and re-find his pre-AS form. Kazuto Yamazaki is a Sports Contributor for The Scoop. Follow him on Twitter at @Kazuto_Yamazaki.